Walnut Base 3". 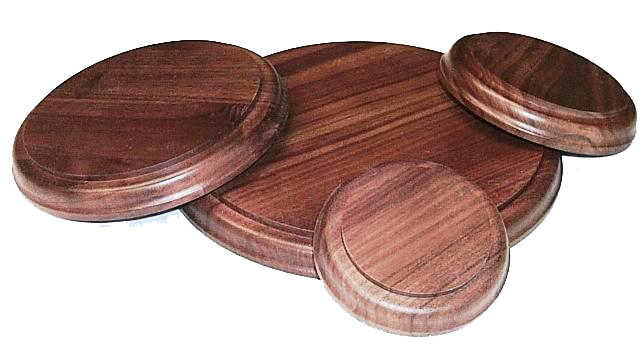 Round, 3/4" thick, high-quality walnut. Notched edges keep the display case cover you make neatly in place. Sizes vary slightly-be sure to measure your base carefully before building the cover. Walnut Base 4". Round, 3/4" thick, high-quality walnut. Notched edges keep the display case cover you make neatly in place. Sizes vary slightly-be sure to measure your base carefully before building the cover. Walnut Base 5-1/2". Round, 3/4" thick, high-quality walnut. Notched edges keep the display case cover you make neatly in place. Sizes vary slightly-be sure to measure your base carefully before building the cover. Walnut Base 8". Round, 3/4" thick, high-quality walnut. Notched edges keep the display case cover you make neatly in place. Sizes vary slightly-be sure to measure your base carefully before building the cover. Walnut Base 4" X 4". Square, 3/4" thick, high-quality walnut. Notched edges keep the display case cover you make neatly in place. Sizes vary slightly-be sure to measure your base carefully before building the cover. Walnut Base 6" X 6". Square, 3/4" thick, high-quality walnut. Notched edges keep the display case cover you make neatly in place. Sizes vary slightly-be sure to measure your base carefully before building the cover. Walnut Base 8" X 8". Square, 3/4" thick, high-quality walnut. Notched edges keep the display case cover you make neatly in place. Sizes vary slightly-be sure to measure your base carefully before building the cover. Walnut Base 10" X 10". Square, 3/4" thick, high-quality walnut. Notched edges keep the display case cover you make neatly in place. Sizes vary slightly-be sure to measure your base carefully before building the cover. Walnut Base 12" X 8". Rectangle, 3/4" thick, high-quality walnut. Notched edges keep the display case cover you make neatly in place. Sizes vary slightly-be sure to measure your base carefully before building the cover.